The dance party stencils are getting bigger and bolder. Around the middle of June ads for JUST? 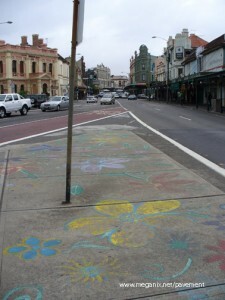 at Club 77 were sprayed all over inner-west pavements. Those in the know know where Club 77 is. Within a few days, Skiver TEK had obliterated the JUST? 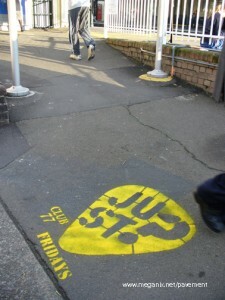 plectrum at Stanmore Station with their own stencil. I guess they had their reasons. But there are still plenty of those big JUST? stencils around. Arrow chases are the urban version of Hare and Hounds. 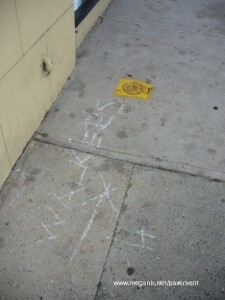 Kids chalk arrows on the pavement instead of leaving paper trails, and Hash House Harrier clubs sometimes write esoteric instructions beside their arrows. I spotted the ‘Walkers’ arrow near Stanmore Station. AF remembers being on a run with his club some years ago in Melbourne when the arrows petered out near a tram stop. Not knowing what else to do the group of sweaty runners got onto the next tram that came along and rode to the end of the line. There they found that the arrow trail had resumed with the instruction ‘ON ON’. Arrow chases probably explain many of the chalk arrows you see in the streets, but others are written on the pavement for the benefit of strollers and shoppers, pointing the way to shops, markets and garage sales. These arrows come in all sizes with all kinds of text and embellishment. 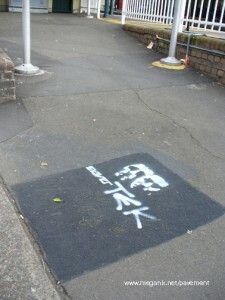 The ‘Psst – garage sale’ arrow and a set of others like it were in King Street, South Newtown, last year. A replica of Stace’s one-word sermon is preserved in metal near a fountain below Town Hall Square. Unfortunately is it is hidden from most people except the patrons of a café whose outdoor chairs and tables surround it. 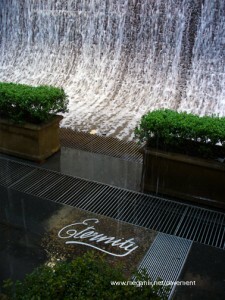 It was raining the day I took this photograph – the cascades off the café umbrellas matched the cascading fountain. Every now and then I come across ‘Eternity’ written in chalk by someone trying to imitate Stace. 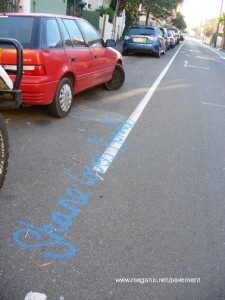 And a stencil artist in Melbourne has used the form of Stace’s word to write ‘Optimism’ on the pavements there. (* I have written about chalk and pavement writing in ‘The Eternal City’, Meanjin 65(2), 2006, pp.139-146). 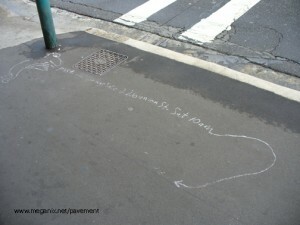 Dribble and splash are becoming more common as ways of writing pavement graffiti. 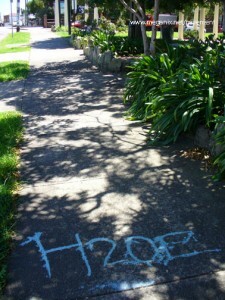 H2OE was busy making large and small versions of his watery mark around Newtown-Stanmore-Petersham in 2008. How does he actually do it? Over the years I have found York Street in the CBD to be a very fruitful site for pavement observation. Last week I spotted this line of scribbles near Barrack Street. 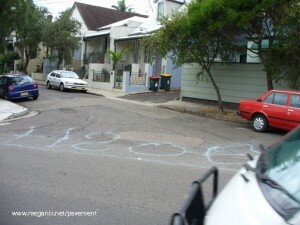 These scribbles are not meaningless – they are a record of the City of Sydney’s Rapid Removal policy on graffiti. I missed out on seeing the advertising stencils they replaced. ‘Rapid’ is a relative term, of course. A larger and less dainty scribble at the south end of King Street, Newtown shows where a ‘No war’ pavement art work used to be. It must have been there for some years before it was overwritten in 2008. I was very sorry to find it gone, especially as it was in a precinct where there is some tolerance for graffiti. 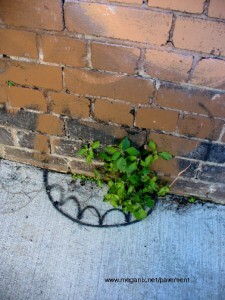 A thoughtful graffitist provided a decorative fence for this little garden of asthma weed near Piss Alley in Enmore. To see another tiny nurtured garden, check out Darlinghurst Nights. 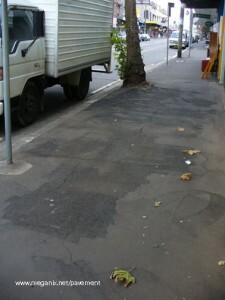 Elsewhere in Enmore, pavement degeneration around a cast iron alignment pin has created a niche for a weedlet garden. 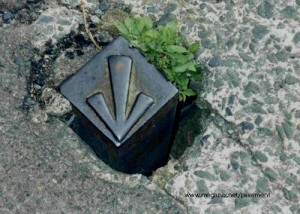 Many thanks to PC for his enthusiastic explanation of alignment pins, which indicate where the surveyed kerb line is. For me, official pavement embellishments such as hydrants, manhole covers, and the various kinds of alignment posts, pins and stones, can be enjoyed for their aesthetic qualities or read like an archive of urban development. 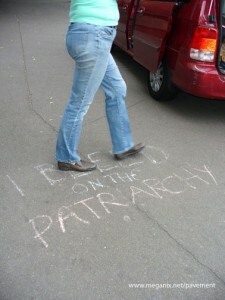 A friend has suggested to me that angry people write on the pavement because they want to be trampled on. I’m not so sure. Anyway, some angry people chalked their way down Broadway one night, from Broadway Shopping Centre to the University of Technology, Sydney. There was a mixture of rants, but you get the gist. In a week when we are reminded that influenza is from pigs and birds, perhaps it’s time to reflect on the message spread by some aggrieved crusader in 2007-2008. 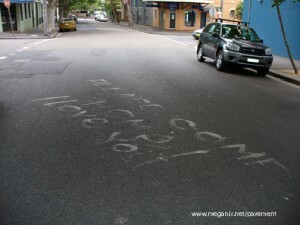 This person broadcast their warning widely around Sydney’s northern beach suburbs and also in the city itself. 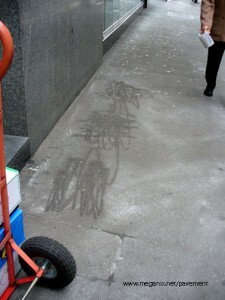 Pavement graffiti is fairly rare in the CBD — it soon gets scrubbed off by cleaning machines. 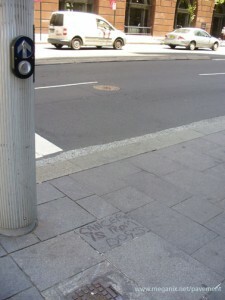 This example was on the corner of Elizabeth Street and Martin Place, and judging from the reddish remnants on the greasy writing the medium was lipstick. Mine is not the first blog to mention the Cancer is from dog’s campaigner (see here for example). 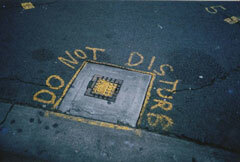 The apparently errant apostrophe drives some people mad. In this case it is not a matter of incorrect grammar but rather an indicator of the writer’s social delicacy. 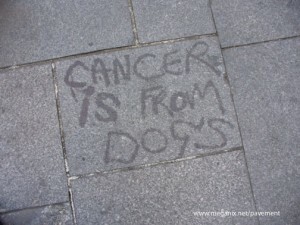 However the graffitist was feeling less constrained when they wrote the full message in texta on a hoarding in George Street: Cancer is from dog’s poo (then again, maybe it was an indelicate apostrophe vigilante who filled in the missing word).